We had a discussion about these on the Facebook page a while back and in a post on the blog. Once you’ve had homemade tortillas you will never go back to the store boughten (yep that is a word up here so all the grammar police can relax 🙂 ) ones. 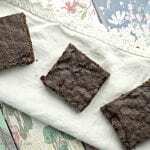 These are fairly simple to make and they have SO much flavor compared to the other ones! Mix all the ingredients together. I usually make a double batch because I like to keep half in the fridge and half in the freezer for another time. The recipe posted will make 10 tortillas. 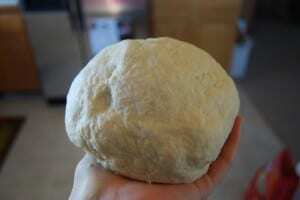 After you mix the ingredients, knead the dough until it’s very smooth. I love the texture of this dough. It’s slightly sticky but not sticky enough to need more flour. After you knead it, let it rest for about 20 minutes. That’s the key to getting it rolled out. 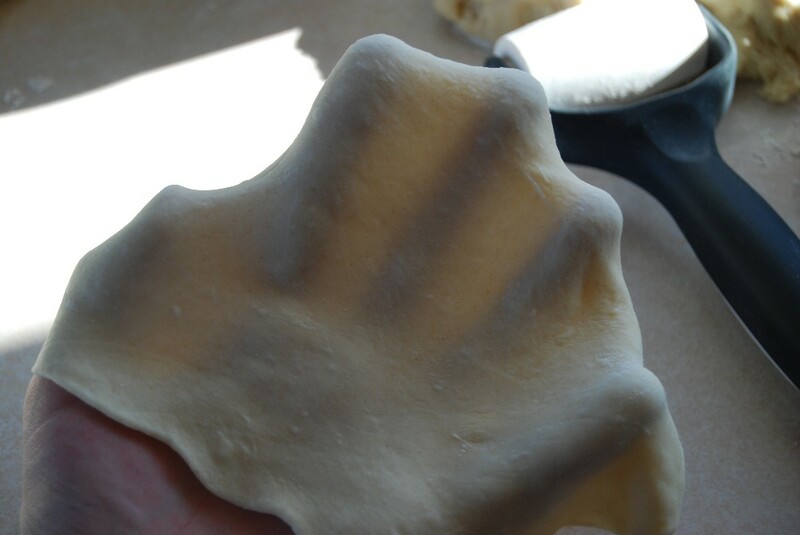 Separate the dough into 10 pieces. 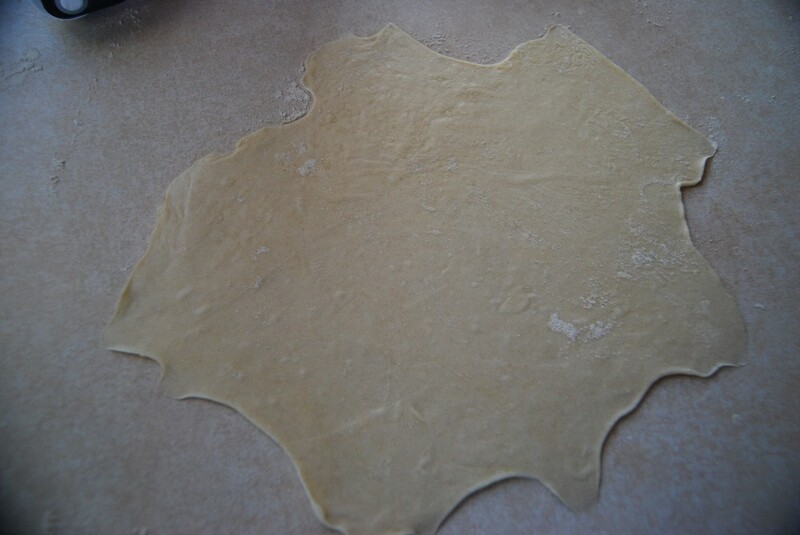 Roll out each piece very very thin, you may need a little bit of flour on the counter to do this but not too much. Make sure the dough is thin! Put the dough down on a preheated griddle. A large frypan will work but won’t be as easy. You do not need to grease the griddle. Flip the torilla over after a few seconds. I just do this with my fingers. It will have nice brown spots on it. They only have to cook for about a minute. Don’t overcook or they will get hard. These are amazing fresh off the griddle! Thanks! I am one who asked for this post. I have a fabulous new French rolling pin that my Mom got me for Christmas just waiting to do something like this. 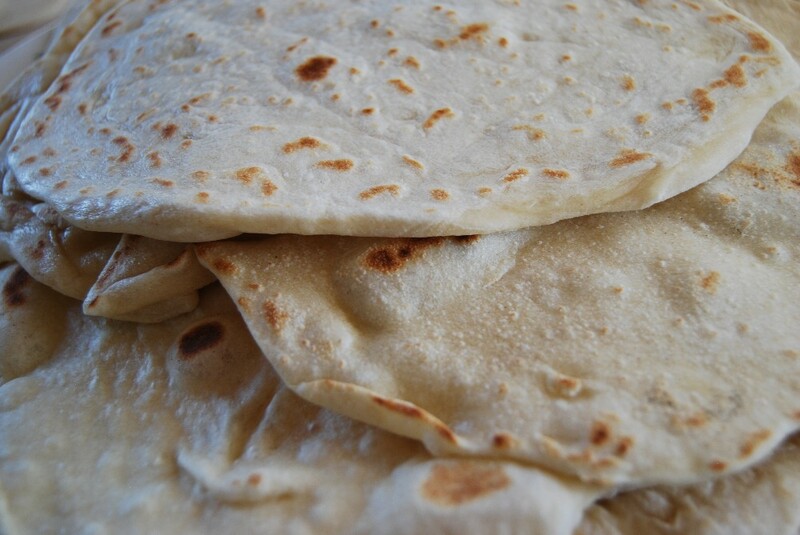 There is nothing better than home made flour tortillas. I would like to link to this page on my website. Good how too! You are more than welcome too, just be sure to post a linky back to my original post:) Thanks. I am going to link right to your post instead of putting your info on my site. I believe in giving absolute credit for the work you did. Thanks for posting this! I learned to make tortillas from a nice local lady in Mexico in college, but of course I’d completely forgotten how. I’m going to try this this weekend! Mine aren’t too puffy but I roll them really thin. I haven’t made them with water so I’m not sure. When you use milk instead of water with scrambled eggs, it makes it puffier so probably works the same with tortillas. If you want a nice thin omelette, you use water and not milk with the eggs. My mother always made them with water and they were thin and flat, not puffy. I wonder if you could do whole wheat instead of the white flour? Would you need to change any of the other ingredients? Or flavor it, like with basil, garlic, sun dried tomatoes? Hummm, my mind is spinning with all the flavor combinations. Merissa, how long will these keep? Are they pretty much a “make as much as you’ll eat in a meal” thing? Or will they freeze and thaw ok? I make double batches and freeze them all the time. They last for a decent amount of time in the fridge but usually I only keep out what we will use within a week otherwise I freeze them. They freeze really well! Welcome! I freeze them all together in a gallon size freezer bag. Usually I make a large batch when I make them and then put about 8 tortillas in each freezer bag, enough for a meal or two for us. It works great! Thanks for this recipe. Gonna make them this weekend. Love homemade tortillas! Has anyone tried the mixing and kneading with a Kitchenaid mixer? Does it work as well? thank you for posting this…LOVE IT! 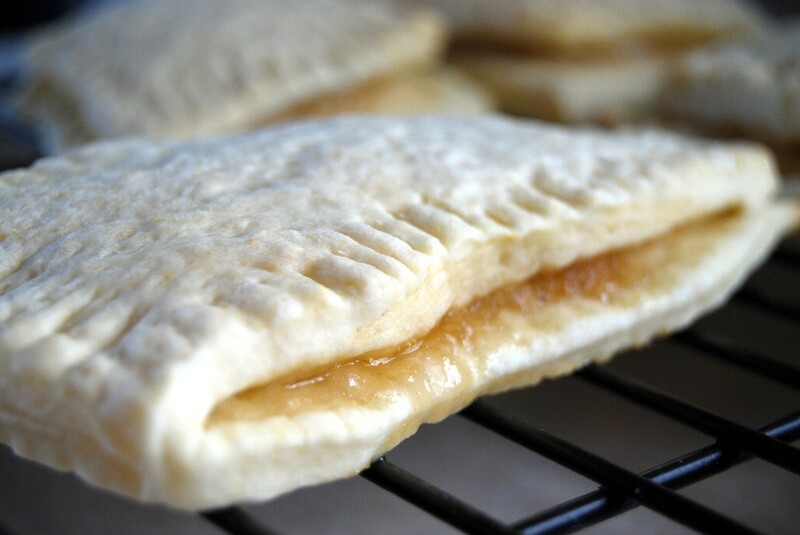 These are on my list of things to try…They will be part of my baking session on saturday. 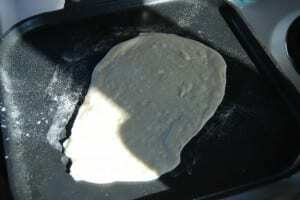 Once you roll out the dough…you can fry this is about one inch of vegetable oil…to get a puffy treat…use it as a base for beans, cheese and topping or sprinkle with powdered sugar…or drizzle with honey! 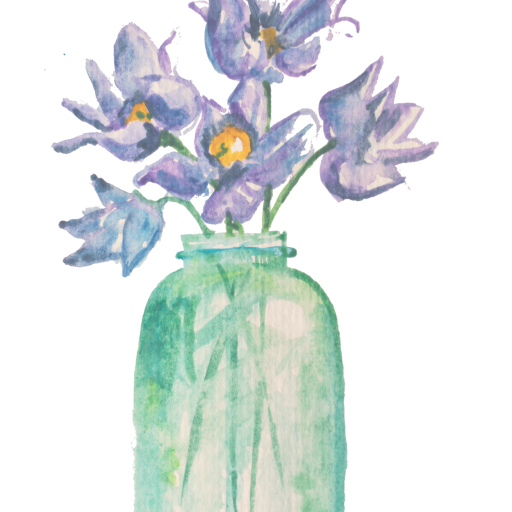 Just another FAB use…. My dad ( i was like 17 years old ) got a recipe for tortillas once and he made them,,,,,,only he did the flip and pat and the works. i think he did it more for my brothers and my intertainment, as him and i both was cracking up,,,lol,,,,but they WERE actully pretty good.lol. I’d love for you to link-up this recipe to the Weekend Whatever Link-up! Two of my grandchildren and I have to be gluten/egg/dairy/soy free. I wonder if I could use rice flour or other gluten free flour and almond or coconut milk. Anyone tried it? I’m sure alternative milk would work and someone just posted on our Facebook page today that an all purpose gluten free flour blend worked for them with this recipe. I haven’t tried it yet but it sounds promising! “boughten” is not a word. It is in Canada too! Though we’d never say “store boughten”. It’s “store bought” or “boughten”, never together. Dialect enriches us. We say boughten here in Ohio too! 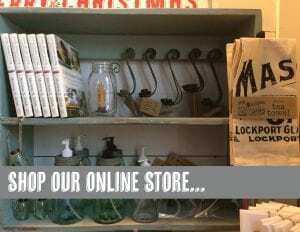 We say boughten here in coastal NC too! :-). The dough rolled out beautifully…all was a go… but it crumbled. What is the T. supposed to be. The totillas were too hard before they turned out with any brown spots. I used rice milk also. HELP! I’ve never used rice milk so I’m not sure on that one. T= tablespoon. 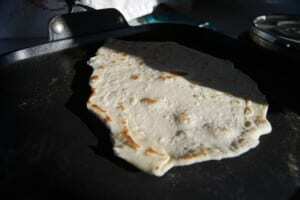 And when you fry the tortillas, make sure they are undercooked, or at least seem undercooked. Then they will stay soft and not get hard. What T. (temperature) should it be if I use an electric griddle? Thanks for your reply…I love in your site! I put it on a pretty high temp (over 350). Just enough to brown each side. What sort of container do you use to hold your tortillas in while in the frig? Baggy to get all the air out or a tupperware like container? We eat tortillas ALL the time, I might as well be making my own! I’m slowly transforming my baking into making all my ingredients, and relying less on store-bought items. I just use a gallon size ziploc bag for the fridge or freezer. 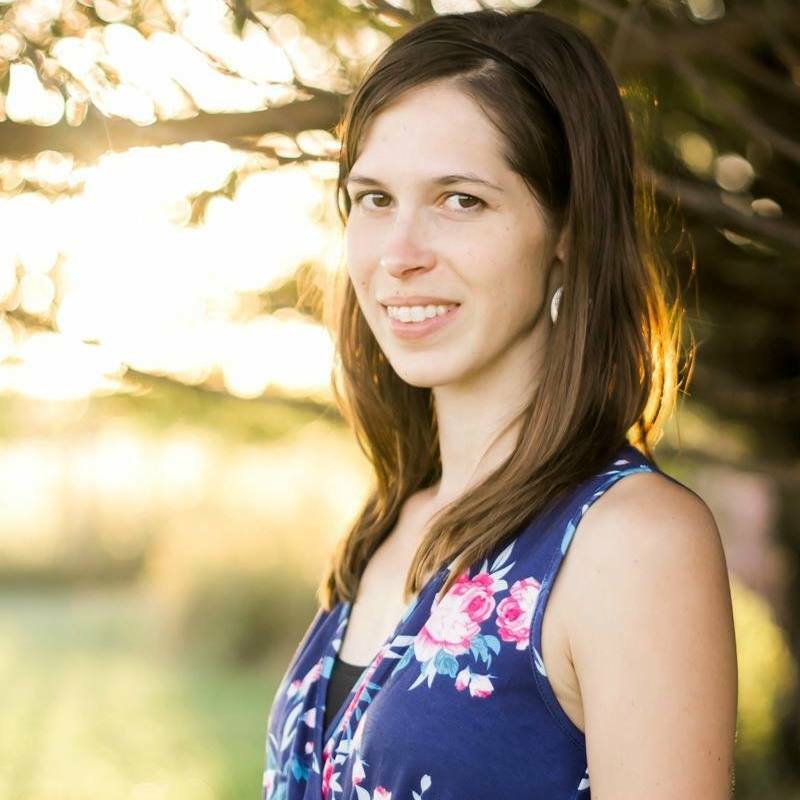 I truly enjoy your blog! Thanks for all the great things you share and for all of the time you devote to it. I look forward to making this recipe. I know they will be a big hit with my family. God bless you! I think I will try these using corn flour we are trying to eat less of items made with white flour. They sound very good. I’m sorry but I’m not seeing that in this recipe. Is it another one you are referring to? A, I think you’ve misread the recipe – it’s 1 1/2 t(easpoons) baking powder, not 1 1/2 c(ups). Tortillas are a staple in our home. We use them for breakfast, lunch, dinner–even dessert! Chocolate tortillas and Poor Man’s Crepes are two favorites. Tortillas is so similar to indian roti ! I have been making these using a kitchenaid mixer with dough hook but have to use much more flour than what it calls for. Has anyone else had this happen? They are great but was wondering. You should try with corn flour. I believe corn tortillas are better. I’m sorry but I honestly have no idea, our diet is just from-scratch and real foods and I don’t count calories or carbs. I now make them every day -thank you! takes me about as long to make them as to brew a cup of coffee! I use warm water instead of milk. Works just fine. And the secret is in “resting” the dough for 30 minutes before cooking. Puff is determined by baking powder. I love the description :post it note sticky, that’s it exactly! Could you please tell me what kind of oil you used. I like olive oil, but am not sure if that would be a good one to use. Can’t wait to try this. Thank you. I use a mild olive oil in this recipe. I am gluten intolerant and use Jules all-purpose flour. Do you think this will work with this flour?? Tortillas are the one thing besides bread that I miss. However, I do not miss the headaches. I think it would work as long as the flour has xantham or guar gum in it, or you can add in some separately. If you would like really thin tortillas, take a hint from Chinese Pancakes. They slightly roll out two, paint oil atop one, stack and finish rolling. After cooking, you peel apart and get two very thin ones. Liking all these questions ! You will find tortillas are like everyones favorite biscuit or dinner roll recipe… They all can be a little bit different. I was raised eating these all my life (both parents from NM) so started making them on my own when I was about 12ish. I will add a few comments to all of yours. First corn and flour are made completely different. Corn you use a tortilla press, but flour you roll out. Corn only takes water to make the dough aka masa. 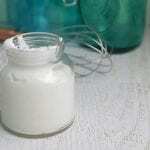 Flour uses shortening, lard or oil. Warm water or hot, salt or no salt (for those of you who don’t want to use salt its okay) and baking powder. Resting the masa is vital ! I personally let mine rest about 10 minutes. My personal recipe uses 4 cups of flour which makes a dozen tortillas. Someone mentioned throwing them in hot oil. These are called sopapillas. When I was little and they puffed up we liked to tear a little end off and stuff with beans and cheese and whatever else was on out plates. Now with a family of my own we drizzle honey on them as a dessert. Also anyone ever have stuffed sopapillas at a restaurant? roll your dough out and then place your items on it. (meat, beans, cheese) and fold dough around it. Make sure nothins peakin. Fry in oil on both sides. Top with green chile, cheese and sour cream YUMMMM. As for storing I have my own special “tortilla towels” that I use to serve with. You can make ahead and place in gallon ziploc bags and freeze ! I skipped the rolling pin and went to the store and paid $20 for a tortilla press. Once I used the tortilla press this recipe made wonderful tortillas, and Also got a dozen tortillas out of the recipe. Made about 12 dozen in no time. I am the “Queen of Kitchen gadgets” as my hubby calls me, he laughed when I got the press but stopped when I made the first batch he loved them. 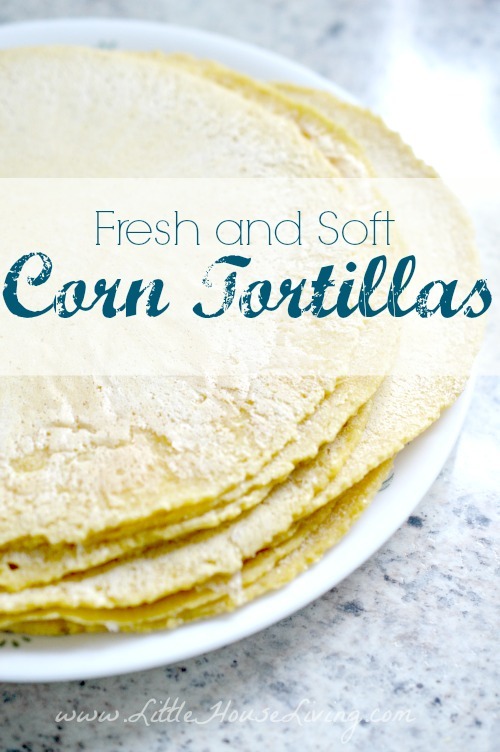 Now I am looking for a good recipe for corn tortillas my favorite. Tortilla press is really not all that exspensive, and if you eat a lot of tortillas like I do at my house it is worth the investment if you are wanting to make them yourself. Yes I agree, tortilla press is totally worth it if you are going to make these often! So, as soon as I saw this recipe, I immediately went to amazon to start looking for a tortilla press. Two of my kids prefer “roll-ups” to sandwiches, so this would be great. 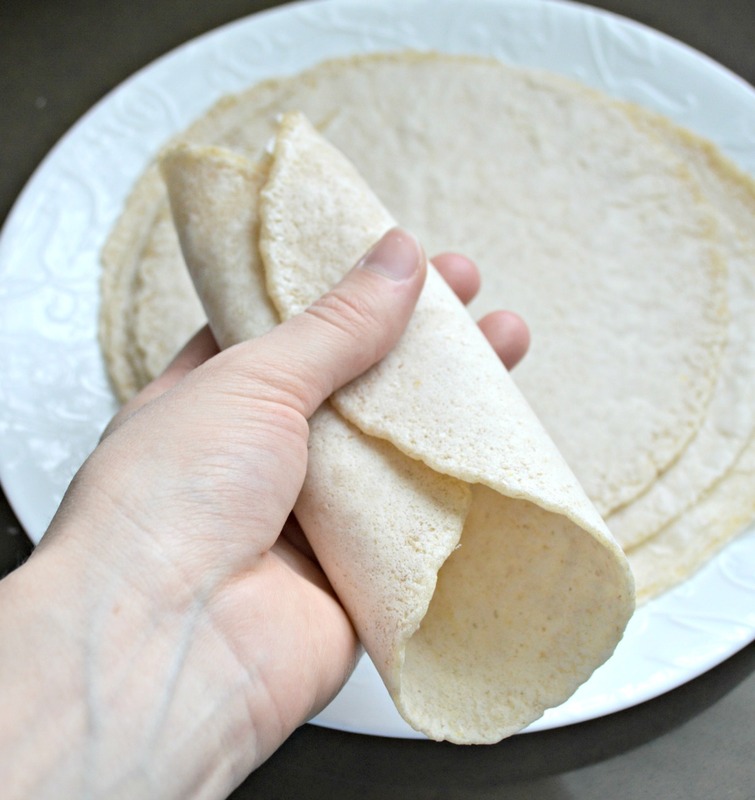 Every tortilla press I see says they were really made for corn tortillas and not flour and that if you do flour tortillas, you should just roll them. Could you share what brand and/or where you got your press? Or is this just a “it’s really made for corn, but I use it for flour anyway” kind of gadget? Thanks!! I actually ended up getting this Tortilla Cooker since I made tortillas so often. It takes a bit to figure out how to use but it works fine for flour tortillas and it’s nice that it cooks them too! I got the same one you got. I finally got around to making them today (snow days in Atlanta – yay!) and they were FAB! I used the half wheat/half white recipe from this site. My kids devoured them and proclaimed them better than store “boughten”! Victory is mine! I’ll definitely try these! Thanks! Boughten is a word in Montana. Love your posts. Thank you. Tried these tonight. Amazingly simple and ohh so good! Thanks for the recipe! This recipe sounds so simple and I can’t wait to try it! I love knowing what goes into my family’s food… Love reading all the comments and tips/advice from the other readers as well. I only have one little problem…I don’t see a Pinterest button for this so I can pin it. 🙁 Thanks for all of the simple and frugal tips and ideas that you share! God bless. The Pinterest button should be at the bottom of the post. I have to use more flour every time I make this recipe but I love the results. Today I am using the sprouted wheat flour that I made from your other post to make my tortillas. Thanks for all you wonderful ideas. I love your site. This recipe looks so easy and delicious! Going to try it soon. Thanks! I love this recipe and have shared it with others but I have found I am dairy intolerant. Is there a substitution that will give the same consistency without the milk? I love your newsletters too. Thanks for the inspiration. You can replace the milk with a milk substitute (almond, rice, coconut milk, etc) or you could just use water.
. And what is the difference with a enchilada and what is the difference in fillings? My dough was so sticky I had to add quite a bit more flour (maybe 1/2 cup more). Any idea why? Even then it was too sticky to roll so I squeezed & stretched it & then gave it a final roll with even ore flour to prevent sticking to the rolling pin. Hmm, I’m really not sure? Did you use a different kind of flour? I made these last night. So fun to make. Total winner! I found I had to add quite a bit more flour as the dough was really sticky with just 2 cups….so I’m guessing maybe ambient humidity has an effect on the dough…? I made them smaller so I got more than 10 and could make them easily in a cast iron skillet. We ate them like pita bread with hummus and dipped them in soup. Kids and husband loved ’em! I’m loving these recipes and all the comments! Thanks for the great ideas.